Plaintiffs own a lot with a single-family home on a hill overlooking a bay. The defendants, Paul and the McGinley's, are their neighbors on either side. The three parties' properties were formerly one parcel, but were subdivided in 1986. 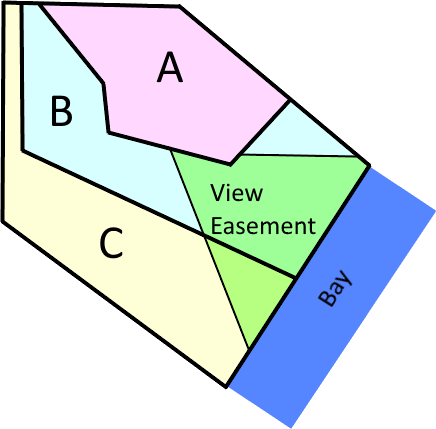 Included in these deeds are view easements allowing plaintiffs' neighbors to trim trees and other vegetation on their property obstructing the view of the bay and forbidding plaintiffs from building structures within the area subject to the view easements. It also extended slightly onto the McGinleys' property. They did not express a duration however. There was already a significant amount of vegetation on the property when its deed was executed in 1999. Plaintiffs then planted a variety of shrubs, bushes, and trees along their boundaries. In 2003, Paul gave plaintiffs notice of her intent to prune the new plants along their shared boundary line down to 2–3 feet, in accord with the view easement. Plaintiffs filed a complaint in the Land Court against defendants, seeking declaratory and injunctive relief about the scope and duration of the view easements, specifically that they were only for a thirty-year period pursuant to the limitation on the duration of certain restrictions on land from Massachusetts law. Land Court judge concluded that the easements were not subject to the thirty-year durational limit. He granted defendants' motion for partial summary judgment and denied plaintiffs' cross motion for partial summary judgment. A view easement is a negative easement, constituting a restriction on the land that cannot be enforced more than thirty years without a notice of restriction. Was defendants view easement an affirmative ease, and thus not limited in duration, or negative easement? A negative easement restricts the use of property, but gives no right to enter or use the property. An affirmative easement "creates a nonpossessory right to enter and use land in the possession of another and obligates the possessor not to interfere with the uses authorized by the easement." The view easement gave defendants the affirmative right to enter plaintiffs' land; it did not limit plaintiffs' use.